"Under the proposed prepackaged plan of reorganization, all existing common and preferred stock will be cancelled upon emergence." "Cancelled upon emergence" means wiped out. CIT's bondholders will get $0.70 on the dollar, but CIT's common and preferred stockholders should not expect so much as a nice parting gift. 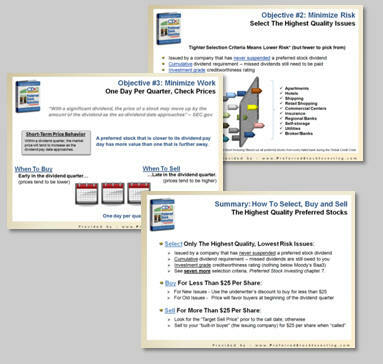 The ten CDx3 Selection Criteria from chapter 7 of my book, Preferred Stock Investing, act as a filter that lets the highest quality preferred stocks through and eliminates the pretenders. I provide you with three of the ten criteria in the sidebar at the top of this CDx3 Newsletter. Notice that one of the criteria is that a regular preferred stock must have the "cumulative" dividend requirement in order to be considered a "CDx3 Preferred Stock." 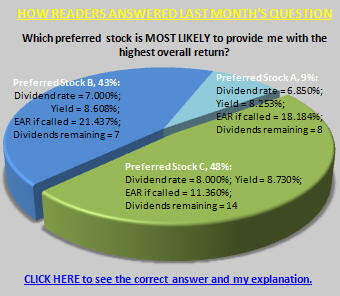 If the issuing company of a cumulative preferred stock misses a dividend payment to you, they still owe you the money. Your dividends accumulate with a cumulative preferred stock. No need to read the prospectus here. 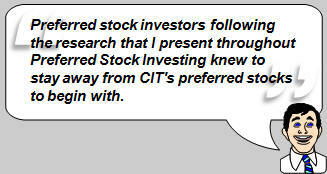 Preferred stock investors following the research that I present throughout Preferred Stock Investing knew to stay away from CIT's preferred stocks to begin with. This table lists the (now) twelve publicly traded Big Banks that have either gone bankrupt or have been acquired since the Global Credit Crisis began in June 2007. The first eight, now including CIT Group, are the ones that went bankrupt while the bottom four are the ones that were acquired by healthier banks. Owners of the bankrupt bank's preferred stock shares were wiped out in each and every case; the preferred stock dividends from each of these banks have been suspended and the investor's principle has been lost. On the other hand, those investing in the preferred stocks of the four acquired banks were saved, their dividends have continued to be paid by the acquiring bank on time and in full. I have made the point in prior issues of this CDx3 Newsletter that throughout this Global Credit Crisis the ten CDx3 Selection Criteria have repeatedly saved preferred stock investors. Looking at the itemization presented in this table, you can see that, just as in the November 1 case of CIT Group, the CDx3 Selection Criteria have filtered out every preferred stock from every failed financial institution since June 2007, and did so in advance. 57 out of 57, one after another, for over two years now, the CDx3 Selection Criteria filtered out the preferred stocks from Lehman Brothers, Fannie Mae, Freddie Mac, New Century, Washington Mutual, Bear Stearns and, this month, CIT Group (IndyMac had no preferred stocks trading at the time of its bankruptcy). And the same ten CDx3 Selection Criteria let through certain preferred stock issues from National City, Countrywide, Merrill Lynch and Wachovia - the very four that were saved through acquisition. A 100% success record of saving preferred stock investors during the most extreme conditions for over two years straight. 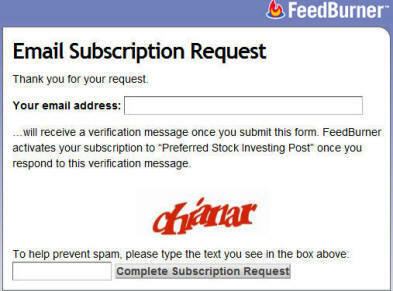 For subscribers to the CDx3 Notification Service, we screen regular preferred stocks to see which ones meet the ten CDx3 Selection Criteria and subscribers are automatically notified by email when a new CDx3 Preferred Stock is about to be introduced to the marketplace. We do all of the research and calculations for you. While I wish I could say that the effects of the Global Credit Crisis and recession are behind us, the November 1 bankruptcy of CIT Group provides some compelling evidence to the contrary. Invest in the best. Pick up a copy of Preferred Stock Investing (see retailers) and become a subscriber to the CDx3 Notification Service today. Formerly known to as HealthCare Properties, HCP is an $8 billion company founded in 1985 and headquartered in Long Beach, California. HCP develops and operates 682 healthcare related facilities throughout 43 states and Mexico including senior housing, life science, medical office, hospital and skilled nursing facilities. HCP is incorporated as a Real Estate Investment Trust which means that they are required to distribute 90% of their profits to shareholders (common and preferred). According to HCP's web site, the company "has produced a 15% compounded annual total return to shareholders since its IPO on May 23, 1985 through June 30, 2009." U.S. Census Bureau estimates show that the percentage of our population in the 75-84 age group will climb from today's 7% to about 45% by 2050. From HCP's 2008 Annual Report: "Senior citizens are the largest consumers of healthcare services. According to CMS, on a per capita basis, the 75-year and older segment of the population spends 76% more on healthcare than the 65 to 74-year-old segment and over 200% more than the population average." With healthcare expected to be 17.7% of the U.S. GDP in 2010 (Source: Centers for Medicare and Medicaid Services (CMS), based on the National Health Expenditures report released in January 2009), you can see why HCP's chairman and CEO, James Flaherty remarked in March 2009 that HCP is "...the leading real estate investment trust in the largest industry in the largest economy in the world." To see examples of some of HCP's healthcare facilities, click here. Will the market price of a preferred stock rise or fall toward $25 as the call date approaches? - Preferred Stock Investing Reader's Forum. I think we can agree that the mother lode of investing is knowing something, anything, about the future market price behavior of your investment. The ten CDx3 Selection Criteria are designed to identify preferred stocks that tend to follow what Preferred Stock Investing refers to as the Three Rules Of Market Price Predictability (Preferred Stock Investing, chapter 3). The answer to the above question combines one of these three rules - the Rule of Call Date Gravity - with a piece of research that I provide in chapter 14 of the book. CDx3 Preferred Stocks all have a five year life span from the date they are introduced until their "call date" 60 months (five years) later. Until the call date, the issuing company is obligated to pay you the fixed quarterly dividends. But once the call date arrives, the issuing company regains the right to purchase your shares back from you. If they do so, they must pay you $25 per share, regardless of the then-current market price and regardless of what you originally paid. $25 per share; that's what you're going to receive in the event of a call. If The Market believes that conditions favor the call of a CDx3 Preferred Stock, what do you think the market price of that preferred stock is going to do as the call date approaches? It's going to trend toward $25 per share, of course. If conditions favor a call, no one is going to pay you more than about $25 for your shares as the call date gets closer. By selecting preferred stocks that have a known five year call date, CDx3 Investors know a significant piece of information about the future market price behavior of their CDx3 Preferred Stocks. How likely is a call? In chapter 14 of Preferred Stock Investing, "Selling To Your Built-In Buyer," I provide the results of a study I did to answer that very question. If dividend rates fall far enough, companies will often introduce a new preferred stock at the lower rate and use the proceeds to call an older issue that has a higher dividend rate, resulting in a savings (like refinancing a mortgage when rates drop). My research shows that if the company can save a mere .375% in dividend expense, there is a 91% chance that they will issue a new preferred stock and use the proceeds to call an older issue. Since the current market prices of most CDx3 Preferred Stocks are below $25 per share (current average market price is about $22), knowing that certain issues may be well positioned to be called can work to your benefit. If you were to purchase a CDx3 Preferred Stock today at $22 per share, you will realize a $3 per share capital gain in the event of a call, in addition to those great fixed quarterly dividend payments in the meantime. But as the call date of your CDx3 Preferred Stock approaches, what should you be looking for in terms of its market price behavior? (C) It's impossible to say in advance, it just depends on the market conditions at the time. The answer is (B). If The Market believes that conditions favor a call, the market price of a CDx3 Preferred Stock will fall toward $25 per share as the call date approaches. Here's why. Market conditions will favor a call if the going dividend rate being offered by newly issued CDx3 Preferred Stocks is at least .375% lower than the declared dividend rate being paid by your five year old callable CDx3 Preferred Stock (Preferred Stock Investing, page 218). Remember that when a new CDx3 Preferred Stock is issued, the issuing company and the underwriters get together and figure out what dividend rate the new issue is going to have to pay in order to command an initial market price of $25 per share. In other words, the dividend rate of all new CDx3 Preferred Stocks is set such that there is a market at $25. If the going dividend rate for newly issued CDx3 Preferred Stocks is lower than the declared dividend rate of your CDx3 Preferred Stock (at least .375% lower from our prior analysis in order to motivate a call), and new CDx3 Preferred Stocks command a price of $25 per share, you know that the market price of your CDx3 Preferred Stock is therefore going to be higher than $25. Consequently, when looking at the market price behavior of a CDx3 Preferred Stock that The Market believes is going to be called, you will notice that the market price will approach $25 from above rather than from below; that is, the market price will fall, not climb, toward $25 for a callable CDx3 Preferred Stock as the call date approaches. A separate window from FeedBurner (a Google service) will open on your screen. Enter and confirm the email address that you want articles from the Forum to be emailed to as instructed (don't forget to do the confirmation step). And don't worry - you'll never receive any spam from me and your email address will not be shared. As the preferred stock market continues its recovery, the market prices of many issues are still less than $25 per share. These market conditions provide a rare investment strategy for some preferred stock investors, using the highest quality preferred stocks. The idea is to purchase, for less than $25 per share, high quality preferred stocks that have a high likelihood of being called by the issuing company. When the issuing company of a preferred stock "calls" a preferred stock (see related discussion regarding preferred stock call dates in the ...) they are required to pay you $25 per share, regardless of the then-current price and regardless of the price you originally paid. For this strategy to work, a preferred stock investor needs a list of preferred stocks that (a) are of the highest quality, (b) are beyond their call dates and (c) are likely to be called by the issuing company. On November 2 we implemented a new feature on the CDx3 Notification Service web site that provides a list of about 100 preferred stocks that have exceeded their call dates to subscribers. These preferred stocks meet every other CDx3 Selection Criteria so they are very high quality issues. 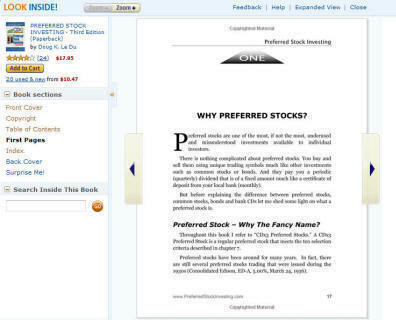 While the trading symbol and description have been grayed out on this screen image to protect subscription values, you can see the example preferred stock that I have circled. Remember that the higher the dividend rate being paid by a preferred stock, the more likely the issuing company is to call it in order to stop the high dividend expense. The 8.750% example that I have circled is just the type of candidate that might be worth investigating if you are a preferred stock investor interested in this strategy. If you could purchase this example preferred stock at, say, $23 per share, you would set yourself up for a $2 per share capital gain in the event of a call plus be earning a 9.5% annual dividend yield in the meantime. I will have more to say about this strategy and the new CDx3 Preferred Stock catalog on the CDx3 Notification Service web site in next month's issue of the CDx3 Newsletter.